Travel Costs > How Much Does an Amtrak Roomette Cost? How Much Does an Amtrak Roomette Cost? 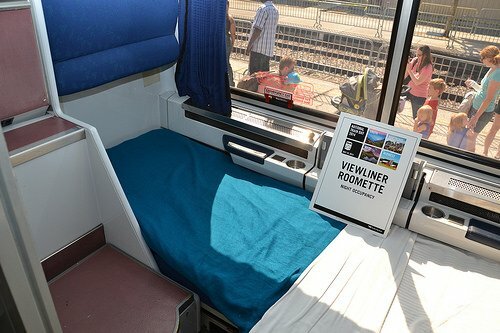 Passengers can purchase a “roomette” on Amtrak if you do not like sleeping while sitting in coach, and this Roomette, according to Amtrak, can accommodate two medium sized adults on its popular Superliner, California Zephyr and Viewliner sleeper trains. The roomette is reasonably comfy, and the chairs are similar to those in the coach. These chairs fold down at night to form a wide, somewhat short bed and can then be folded up during the day. How much does a roomette cost on Amtrak? Amtrak tickets are priced using the fare “buckets” on the basis of availability. The cost of the roomette is similar, whether one or two individuals are in it. On average, one Amtrak roomette costs $200 to $600 more than the seating accommodations in the coach section, according to our research. This fee will be added on top of the regular fares. Like airline tickets, the fares will greatly depend on your destination, so it’s highly advisable you use the Amtrak search feature to know exactly how much your fare will cost. According to one user on this Fodors.com forum thread, she had to pay $331 per night on top of the regular fare. On the Chicago Tribune, the writer noted that he had paid a $575 extra to book a roomette from Los Angeles to Chicago. In Amtrak terminology, a roomette is a small private room. about 3′ x 6′, which occupies only the required space for two comfortable reclining seats facing one another next to a big eye-level picture window with a second window above for additional light. The Roomette is designed for one or two passengers. At night, the seats can be converted to a bed, with an upper berth dropping down from the ceiling. There is about one foot of space between the door and the seats to the room. You get complete privacy when you slide the door closed and draw the curtains. The two chairs get folded out to a bed which measures about six feet, six inches. Other amenities include a reading light, dining car meals, climate control, a garment rack, fresh towels and bottles of water. Meals are free, and bottled water, coffee and juice are available at no charge. A roomette on the Viewliner trains only are equipped with a toilet in the room. The only rooms with a toilet and shower inside the room are the bedrooms. The long-haul trains generally have one-level Viewliner cars and a double-decker Superliner. The impression, according to most who have booked one, is that the Viewliner Roomette is somewhat roomier than the Superliner Roomette. Sherry at CruisMaven.com took pictures of the actual room and offered her review of the space. What’s the difference between an Amtrak roomette vs a bedroom? A bedroom, unlike the roomette, will offer more space, an in-room toilet, shower and a sofa that converts into a bed. It also offers an armchair, a larger window and a private sink. Amtrak created a handy PDF explaining each room and the options. Most Amtrak conductors, as well as sleeping car attendants, are willing to help coach passengers know when their train has unsold roomettes available. If available, and while risky, these fares will be much cheaper than booking ahead of time. You can use frequent-flier miles or upgrade coupons to obtain a better seat. You can also take advantage of last-minute upgrade offerings to potentially reduce your fare. Advance purchase discounts and promotion codes only apply to trains in the lowest bucket. Amtrak occasionally runs 3-day sales online, offering discount offers of up to 50%. There is no advance notice of these type of sales, so make sure that you “like” their Facebook page or join their email list for updates. AAA discounts are available for cardholders.